Arakel Davrijetsi. 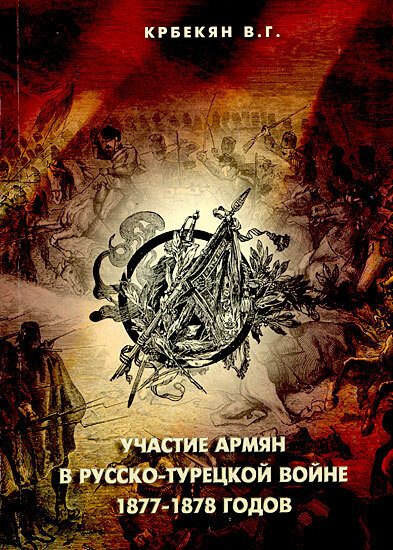 Book on History / Arakel Davrijetsi. – Аmsterdam: Voskan Yerevanci Press, 1669. Atlas of the Armenian History. - Yerevan, 2004. Bryusov V. The Chronicle of the Fortunes of the Armenian People : (dating back to the 6th century BC) / V.Bryusov. – Мoscow, 1918. – 124 pp. – Bibliography: pp. 117–122. Bryusov V. The Chronicle of the Fortunes of the Armenian People : (from the 6th century BC to 1914) / V.Bryusov ; Academy of Sciences of the USSR, Armenian Branch, Institute of History and Material Culture ; [preface by M.G. Nerseryan, pp. V–XI ; article by I.Bryusova and A. Il'insky «Bryusov's work on the Studies The Chronicle of the Fortunes of the Armenian People», pp. XII–XVI]. – Yerevan : Publishing House of the Armenian Branch of the Academy of Sciences, 1940. – XVI, 128 pp., 4 inset sheets contain maps and portraits. – Bibliography: p. 116-121. 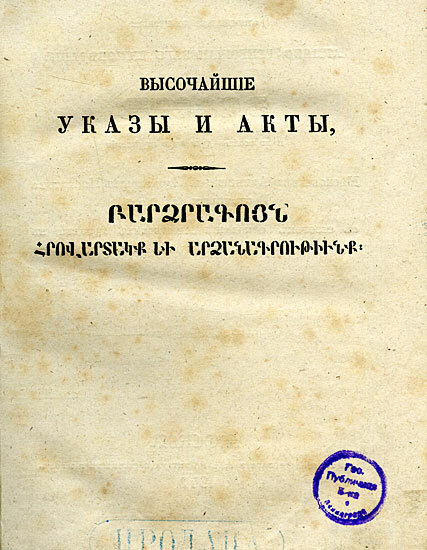 Bryusov V. The Chronicle of the Fortunes of the Armenian People / V.Bryusov ; [preface by O. Ganalanian ; postface by I.Bryusova and A. Il'insky «Bryusov's Work on the Studies The Chronicle of the Fortunes of the Armenian People», pp. 172–178]. – Yerevan : Hayastan, 1989. – 181 pp.,  sheet contains a portrait – Bibliography: p. 156–164. General History by Vardan the Great: (with comments and supplement) / translation by N. Emin. – Moscow : Lazarev Institute of Oriental Languages Press, 1861. – XXIV, 202, 218 pp. – Bibliography in the preface. Imperial Decrees and Acts concerning the Armenian Gregorian Church in Russia. 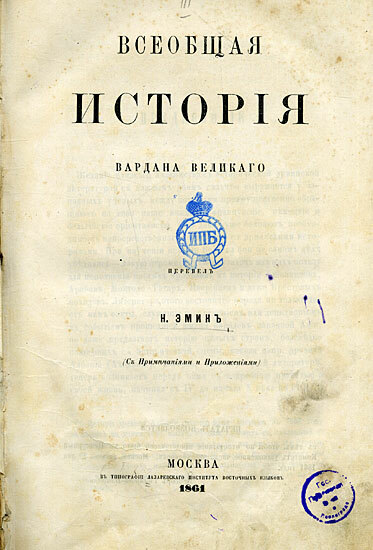 – Moscow : Lazarev Institute of Oriental Languages Press, 1842. – 433 pp. 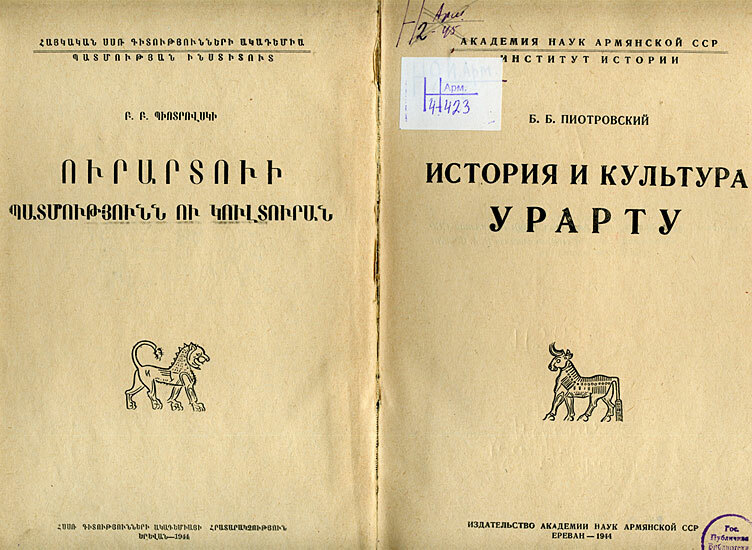 – Parallel title-page in Armenian; Russian- Armenian parallel text. Yegishe. Vardanants History / Yegishe. 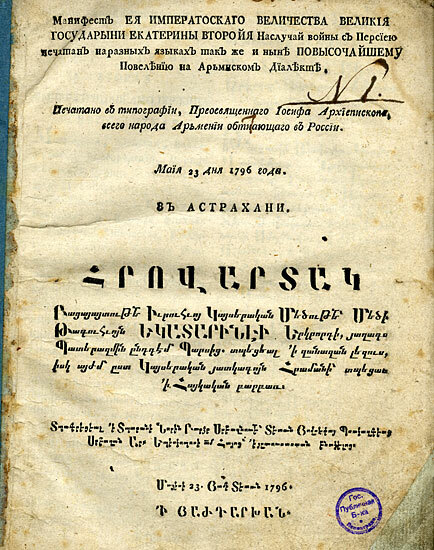 – St. Petersburg : G. Khaldarian Press, 1787. Catherine II. Manifesto of Her Majesty Empress Catherine II on the Occasion of the Persian War : Published in different [!] languages, including Armenian [!] by Imperial [!] order. 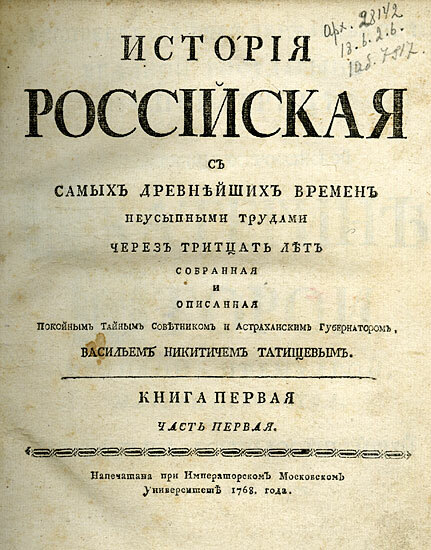 – Astrakhan : Printed in the Publishing House of Right Reverend Joseph, Archbishop of All Armians in Russia, May 23, 1796. – 18 pp. ; 4. 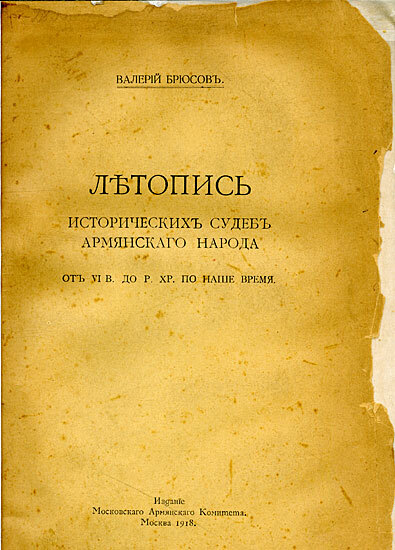 – Russian - Armenian parallel title and text. – Original spelling is retained. Illarionov V. Russian and Armenia: Thoughts about the Past, Present, Future / V.Illarionov, O.Galust'yan. – Moscow : OLMA-PRESS, 2003. – 310 pp., portraits. – Bibliography in the footnote. 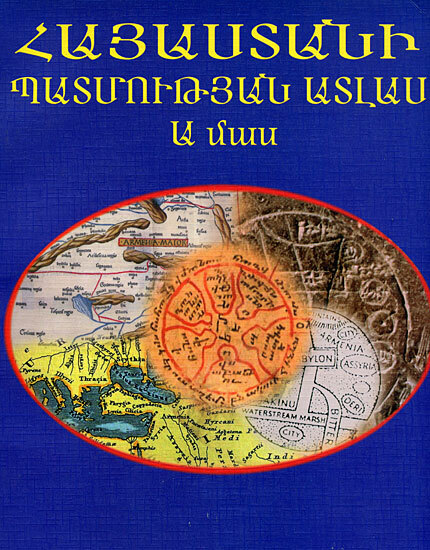 History of the Armenian People : from Ancient Times to the Present Day / G. Sarkisyan, T. Akopyan, A. Abramyan [and others] ; edited by M. Nersisyan. – Yerevan : Yerevan University Press, 1980. – 458 pp. : illustrations, 14 sheets of illustrations, maps. – Bibliography: pp. 428-430. Kazar Parpetsi. Armenian History / Kazar Parpetsi. – Venice, A. Bortoli Press, 1793. [Map of Armenia ] [Maps] / [compiled in Venice in 1751]. - S.l., after 1751. - 1 map: 1 colour; 37х51 (39х52) cm. Engraving. Based on the map and spoken information. Old Armenian? The map shows names and boundaries of states and administrative districts, settlements, monasteries. Under the lower frame are manuscript notes in Russian . 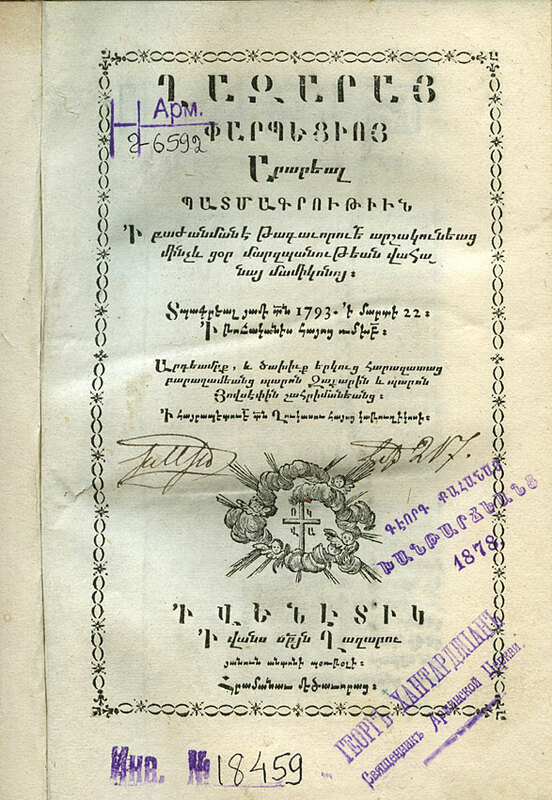 Krbekian V. Participation of Armenians in the Russian-Turkish War of 1877-1878. / V. Krbekian. – Yerevan, 2004. Movses Khorenatsi. 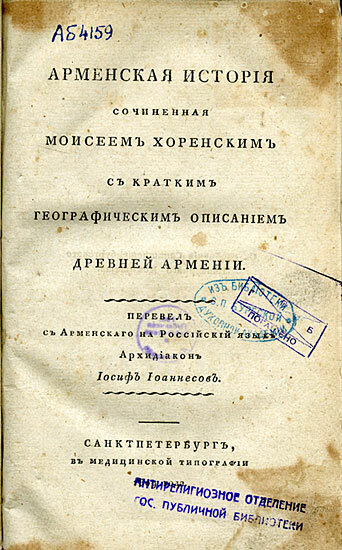 History of Armenia, Writen by Moses of Khoren : [in 2 parts] / translation and preface by I. Joannesov. – St. Petersburg : [Med. Press], 1809. – Part 1, books 1/2. – , IV, 356, XV pp. ; Part 2, book 3. – , 242, IX pp. Movses Khorenatsi. History of Armenia / Movses Khorenatsi. – St. Petersburg : I. Skorokhodov Press, 1889. Movses Khorenatsi. History of Armenia / [work by] Moses of Khoren ; new translation by N. Emin (with comments and supplement). – Posthumous edition. – Moscow : Lazarev Institute of Oriental Languages, 1893. – XXXVI, 324 pp. – (Ethnographic Fund of Nikita Emin ; issue 1). Movses Khorenatsi. 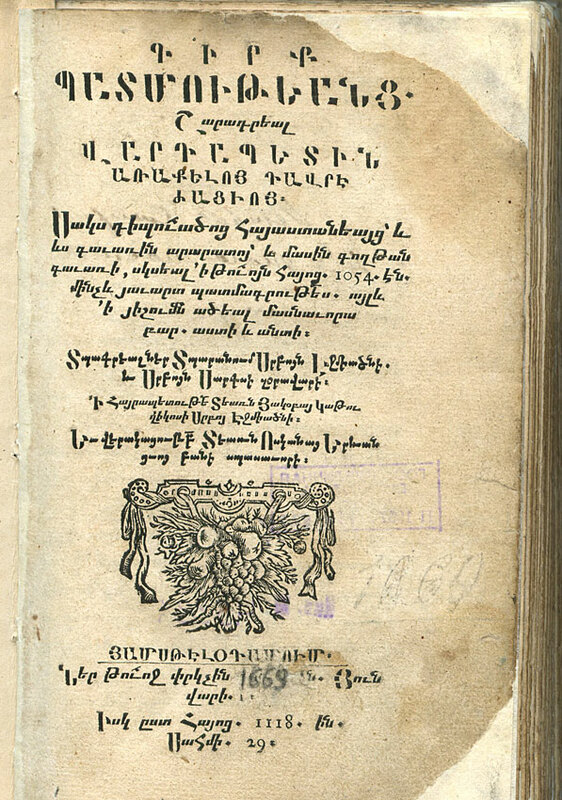 History of Armenia / Movses Khorenatsi ; translation from Old Armenian, preface, and comments by G. Sarkisian. – Yerevan : Hayastan, . – L, 291 pp. : illustrations – Index of names: pp. 267-284. – To 1500 years of History of Armenia by Movses Khorenatsi. Movses Khorenatsi. History of Armenia. / Movses Khorenatsi. 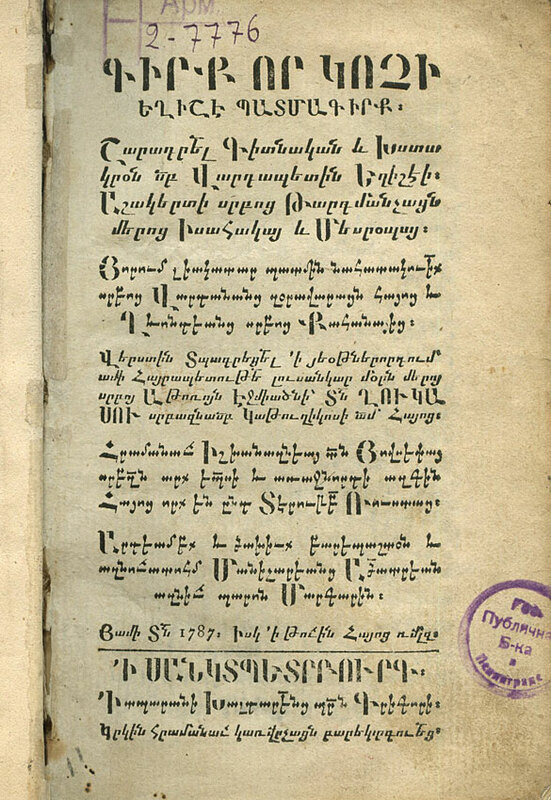 – Amsterdam : T. Vanandetsi Press, 1695. Piotriovsky B. History and Culture of Urartu. / B. Piotriovsky ; Academy of Sciences of the Armenian SSR, Institute of History. – Yerevan : Academy of Sciences of the Armenian SSR Press, 1944. – XII, 364 pp., illustrations I–XVI pp., 1 sh. of map. – Subsidiary decree : pp. 347–364. 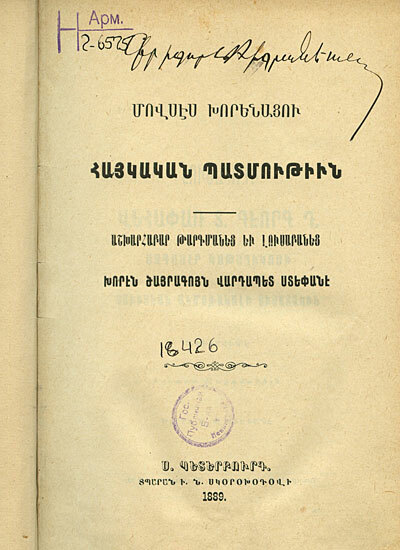 Collection of Reports Supplementing the History of the Armenian People. : in 3 parts. 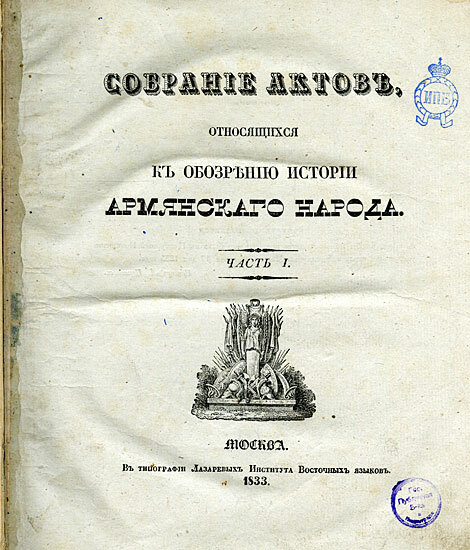 – Moscow : Lazarev Institute of Oriental Languages Press, 1833-1838. 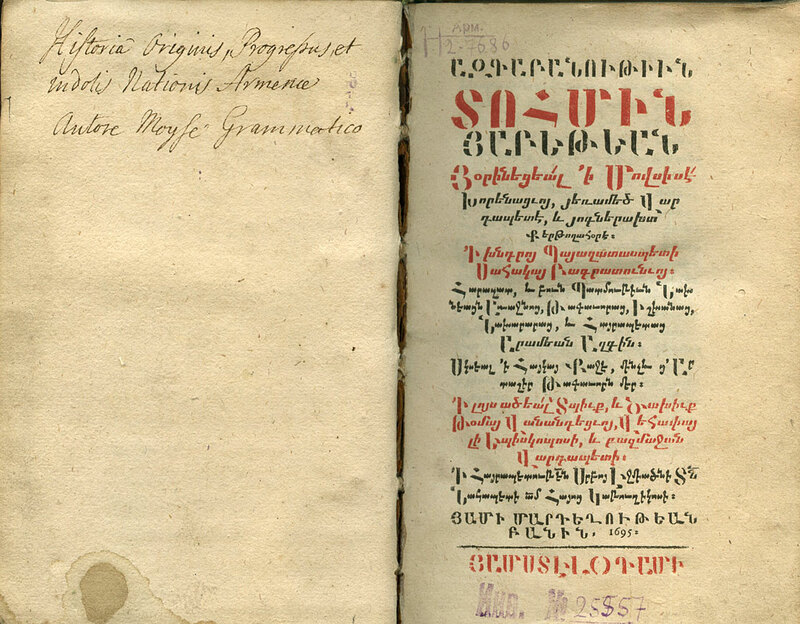 – Text in Russian, Armenian, French and German. Part 1. – 1833. – , VII, II, 395 pp. Part 2. – , III, 504 ppp. Tatishchev V. Russian History Dating Back to the Most Ancient Time... : [in 5 vols.]. – [Мoscow] : Iimperial Мoscow University, 1768–1769. – Original spelling is retained. Vol. 1, part 1. – 1768. – , XXVIII, 224 pp. Vol. 1, part 2. – 1769. – , 225-600 pp. Tatishchev V. Russian History : [in 3vols.] / Vasily Tatishchev. – Moscow : AST, 2003. – (Classical Thought). Vol. 1. – 2003. – 571 pp. : illustrations – Bibliography in footnote: pp. 540-569. Ter-Sarkisyants A. 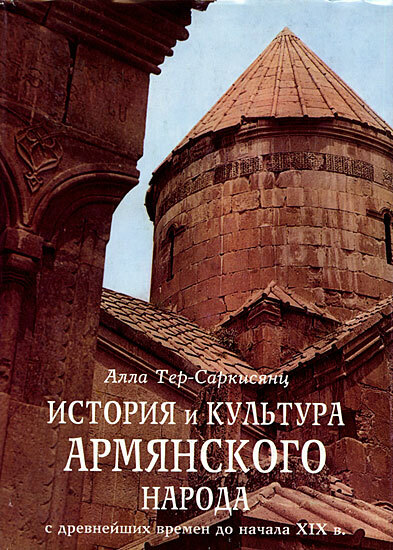 History and Culture of the Armenian People from the Most Ancient Time to the Early 19th c. / A. Ter-Sarkisyants. – Moscow., 2008. 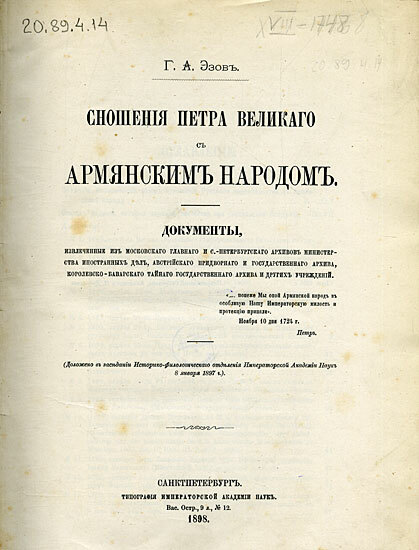 Ezov G. Relations of Peter the Great with the Armenian People : documents from Moscow and Saint Petersburg Archives of the Ministry of Foreign Affairs etc. : / G. Ezov. – St. Petersburg : Academy of Sciences Press, 1898. – , XVI, CLII, 512 pp. – Text in Russian, French, Latin, German and Armenian. – Bibliography: pp. CXLVII–CXLIX. L'Armenie, la Georgie, et le Daqhistan [Maps]. - S.l., [pp. 1730]. - 1 map. : 1 colour; 42х56 (49х61) cm. Engraving. Shown are: boundaries of countries, names of districts , settlements, the place of the signing the peace treaty between Russia and Persia, the place reached by Peter the Great during the Caspian Sea expedition, the location of battles etc. Map of Armenia, Georgia and Dagestan. Symbols: the boundaries of sanjaks and vilayets, settlements, roads, forts, post and telegraph offices, and mineral sources, mountain passes, the boundaries agreed on the Berlin Treaty of 1876 and on San Stefano one of 1878. Special general map of Armenia after the San Stefano Peace Treaty. Made by А. Peterman from official Russian Stebnitsky map attached thereto. From the atlas: Claudii Ptolemaei. Tabulae Geographicae Orbis Terrarum Veteribus Cogniti…[Utrecht]-Franquerae, .